I hope everyone had a safe and fun 4th of July weekend and #ThatBusinessShow launches week 23 this week with another all star cast of entrepreneurs and community leaders. The show which airs weekdays at 8am on 1250WHNZ can be seen On Demand all over the web including http://www.youtube.com/jamiemeloni and on SoundCloud at http://www.soundcloud.com/jamie-meloni as well as on iTunes and http://www.tampabayradio.com via the show info tab! 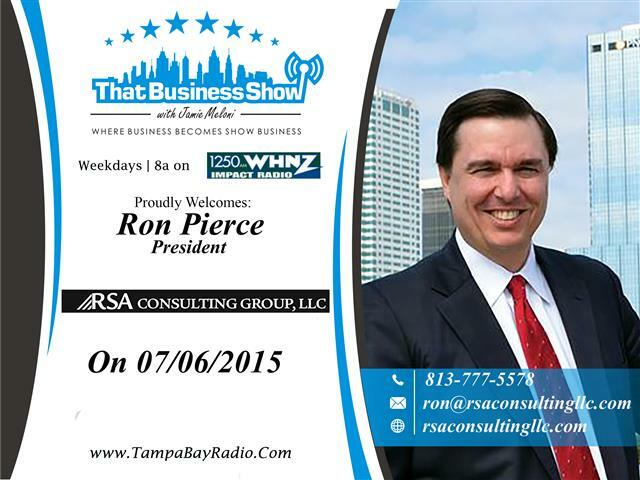 Opening up the show today was Ron Pierce, President of RSA Consulting Group, LLC. Ron has extensive experience in the Florida Legislature were he worked in 1998 as a District Legislative Assistant in the State House, and in 2000, joined Senator Tom Lee’s team including a role as Policy Advisor from 2004 to 2006. Today, Ron has taken his skills in community service, public relations and communications and serves as a lobbyist to a number of area businesses including the Tampa Bay Lightning, Pepin Distribution Company, the Pittsburgh Pirates and Moffitt Cancer Center just to name a few. His firm is a general lobbying firm and serves companies and organizations of all interests. Ron shares some of what it is like to work at the State Capital in Tallahassee and also dispels some of the rhetoric that the government is highly partisan, sharing with us that the government is more in sync than what its constituents believe. Due in large part to 24 hour media cycles, we often do not hear of the cohesiveness, just the partisan politics because that is what draws ratings. Ron also stressed that business leaders need to get involved in their local Chambers of Commerce to ensure their interests are heard and met up in Tallahassee. Learn more about Ron and his company at http://www.rsaconsultingllc.com and Ron can be reached at 813-777-5578 or ron@rsaconsultingllc.com if your business or organization is in need of representation! 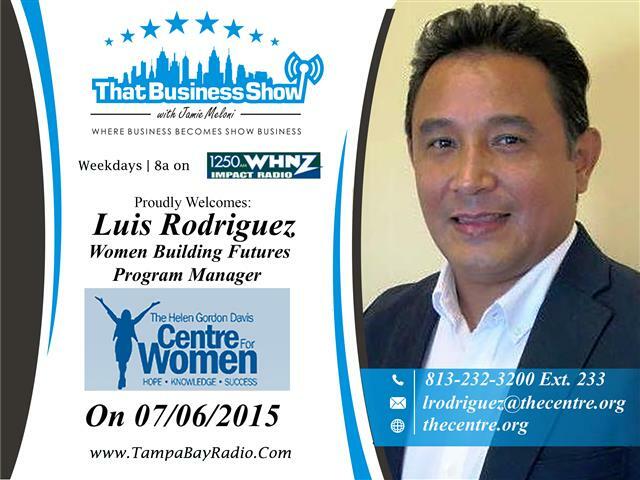 My second guest on the program was Luis Rodriguez, Program Manager for the Women Building Futures Program at the Centre For Women. Founded in 1977, the Centre For Women has assisted tens of thousand of women through many programs including programs centered around family dispute issues, employment, and business development. Luis was on the program today to talk about their latest program which launches July 22nd designed to teach women the construction industry trade. Through a grant from The Department of Housing and Urban Development, The Centre For Women is able to offer this new program to under-privileged women looking to gain entry into the construction trade. Through their 10 week program, not only will the participant develop useful skills and knowledge but also a safety certificate from OSHA that is of value to Contractor employers and typically a $100 cost, of which is picked up by the Centre For Women. The only requirements for participants is that they are under-employed and living in Hillsborough County outside of Tampa City Limits. Interested women should reach out to Luis directly at 813-232-3200 Ext 233 or email at lrodriguez@thecentre.org and you can learn more at http://www.thecentre.org! This entry was posted in Entrepreneurship and Business and tagged business, centre for women, construction trade, entrepreneur, lobbying, lobbyist. Bookmark the permalink.